Copyright �2014 London Christopher/PopEntertainment.com. All rights reserved. Posted: January 18, 2014. His Scientist Adds Mystery To A Pandemic In Syfy�s Helix, and He Discusses His New Steven Spielberg/Halle Berry TV Series Extant, Voicing A Despicable Me Minion and His Extraordinary Career From King Lear To The Last Samurai! Japanese actor Hiroyuki Sanada is best known for his superb portrayal of the reluctant Samurai, Seibei Iguchi, a sensitive and loving family man in the 2002 Japanese foreign language film, Tasogare Seibei (The Twilight Samurai). That film was nominated for an Academy Award for Best Foreign Language Film. It swept the Japanese Academy Awards, winning twelve awards including for Best Picture, Best Director, Best Screenplay, Best Actress, and a Best Actor win for Sanada. Sanada, who was born in Tokyo, was already a major star in his native Japan, having crafted an extensive, multi-faceted, and stellar acting career on stage, screen, and TV. The Twilight Samurai and its talented star caught the attention of US and international audiences � and filmmakers who wanted to see more. Hollywood came calling the very next year in 2003, with Sanada�s American major film debut in The Last Samurai, starring with Tom Cruise. From there, Sanada�s career took off. Hiroyuki Sanada began his acting career at just five years old, playing a Yakuza�s son in a Japanese film, after a talent scout noticed and enrolled him in a school for child actors. Sanada also trained with martial arts icon Sonny Chiba�s Action Club. He went on to star in a host of hugely successful martial arts and Samurai films, many for Sanada�s favorite film director, Kinji Fukasaku. These included 1981�s Makai Tensho (Samurai Reincarnation) � which garnered Sanada a Japanese Academy Award for Best Newcomer Of The Year � and 1983�s Satomi Hakkenden (Legend Of The Eight Samurai). Sanada then went on to amass a diverse and acclaimed landscape of roles. 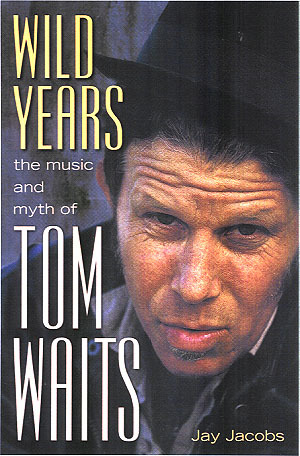 His work in drama, romance, comedy, horror, science fiction, and musicals showcase his immense emotional depth and range. Sanada starred as the heroic father in 1998�s Ringu and its sequel, 1999�s Ringu 2. Ringu is Japan�s highest grossing horror film and a cult classic that paved the way for many Japanese horror films to become hit underground favorites here in the USA. Both films were remade here in America, into hit English language films, as 2002�s The Ring and 2005�s The Ring Two. Hiro also starred in numerous Japanese TV series, including the hit 1997 Japanese dramatic TV series Konna Koi No Hanashi (A Story Of Love), which dealt with serious, topical issues of social commentary within its romantic subplot. Sanada�s first love is the theater, as well as also being a gifted singer, songwriter, and musician. He has continued to light up the stage throughout his career. He starred as Seymour in the 1987 Japanese stage production of the hit horror rock musical and comedy The Little Shop Of Horrors. Hiro also appeared in Japanese stagings of the Tony� award winning Broadway musical Big River in 1988, Broadway Bound, the Tony� nominated story of playwright Neil Simon�s life in 1989, and Shakespeare�s Romeo and Juliet in 1986. In 1998 Sanada became much the venerable thespian owing to his lauded role in Hamlet on the London stage with a Japanese theater company. This led to Sanada receiving international acclaim when British actor Sir Nigel Hawthorne personally invited Hiro to star with him and portray The Fool in The Royal Shakespeare Company�s 1999 and 2000 London stage production of King Lear. Sanada learned and became fluent in English for his role in King Lear. Sanada�s portrayal in King Lear also garnered Sanada an honorary MBE (Member of the British Empire) from Queen Elizabeth II. After Sanada�s international acclaim in The Twilight Samurai, he lit up the American screen for the first time in the fact-based blockbuster history epic, The Last Samurai, in 2003. Sanada portrayed the formidable and proud Samurai warrior Ujio, who mentors Tom Cruise�s character, Captain Nathan Algren. The role of Ujio became a favorite with American audiences. An esteemed dream list of directors and actors went on to cast Sanada in their illustrious work. Art house film director James Ivory cast Sanada in two of his critically acclaimed films. The first of those was 2005�s The White Countess starring opposite Ralph Fiennes in a tale of emotionally vulnerable people traversing the political upheaval of 1930�s Shanghai. Ivory again sought Sanada�s talents in 2009�s The City Of Your Final Destination starring as Anthony Hopkins character�s young gay lover. In 2007 Sanada starred with Chris Evans in director Danny Boyle�s science fiction disaster film Sunshine. Sanada also portrayed a villain opposite Chris Tucker and Jackie Chan in director Brett Ratner�s comedy action hit Rush Hour 3. The infamous Lana and Andy Wachowski (of The Matrix fame) invited Hiro to play Mr. Musha, President of Musha Motors in their 2008 live action film of Speed Racer. The last few years have seen Sanada celebrate a cult status for his many recent film and TV roles throughout the science fiction, fantasy, and comics genres. Sanada lit up fan boards and garnered acclaim from mainstream audiences as the mysterious �Other� Dogen on season six of the ABC TV Network�s Lost and for the role of Satoshi Takeda, the martial arts mentor to Emily VanCamp�s character Emily Thorne on ABC�s Revenge. 2013 saw Sanada starring opposite Hugh Jackman in the summer blockbuster The Wolverine, the hugely popular X-Men spinoff. Hiro also stars in the independent, critically-acclaimed film The Railway Man, along with Colin Firth, Nicole Kidman, Jeremy Irvine and Stellan Skarsg�rd, The movie is the autobiographical true story of Eric Lomax, a British soldier and survivor of a WW2 Japanese POW camp, coming to terms with his past in the present day. The film received standing ovations and accolades from the press when it premiered last September 2013 at The Toronto Film Festival. Sanada portrays Takashi Nagase, the Japanese Officer who tortured Eric in the camp, who also comes to terms with his past in the present day. December 2013 saw Sanada star in 47 Ronin, opposite Keanu Reaves. Hiro portrayed real life Samurai hero Oishi Yoshio in the blockbuster supernatural fantasy envisioning of the true story of Japan�s most beloved and legendary chapter in their nation�s proud history. 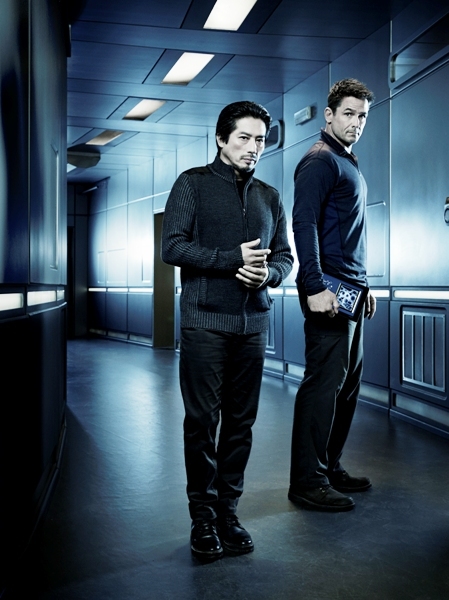 On the day of the January 10, 2014 premiere of Helix, Sanada�s new science fiction, suspense thriller TV series, Hiro graciously took time to discuss his starring role as mysterious scientist Dr. Hiroshi Hatake. Helix is executive produced by Alan D. Moore, renowned screenwriter and producer of Battlestar Galactica and Star Trek: The Next Generation. The series also stars Billy Campbell, Kyra Zagorsky and Mark Ghanime. 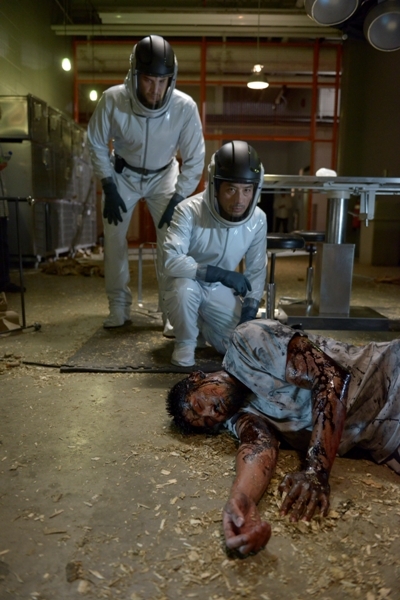 Helix airs on the Syfy Cable Television Network, Fridays at 10pm EST. Hiro also regaled me about his luminous acting and music career, and the many esteemed upcoming creative projects he�s currently working on. This summer 2014 he will be starring with Oscar� winner Halle Berry in the CBS Television Network�s science fiction series Extant, produced by Steven Spielberg�s Amblin Entertainment. Sanada is also voicing the character of Sumo Villain in the summer 2015 Despicable Me spinoff animated feature film, Minions! 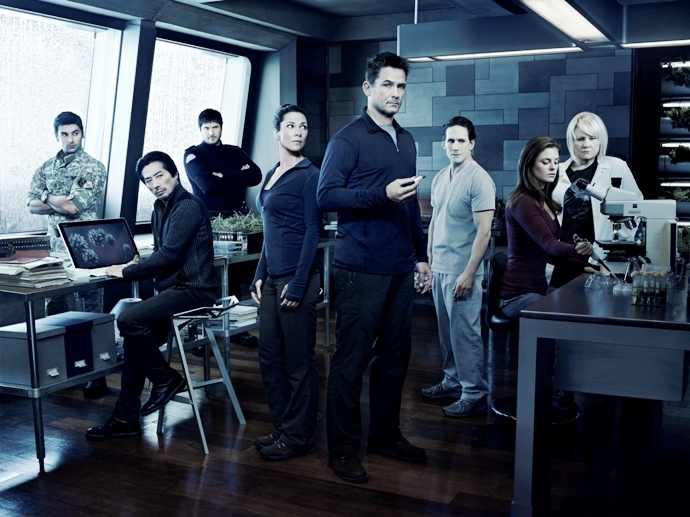 Congratulations on the January 10, 2014 premiere of Helix. 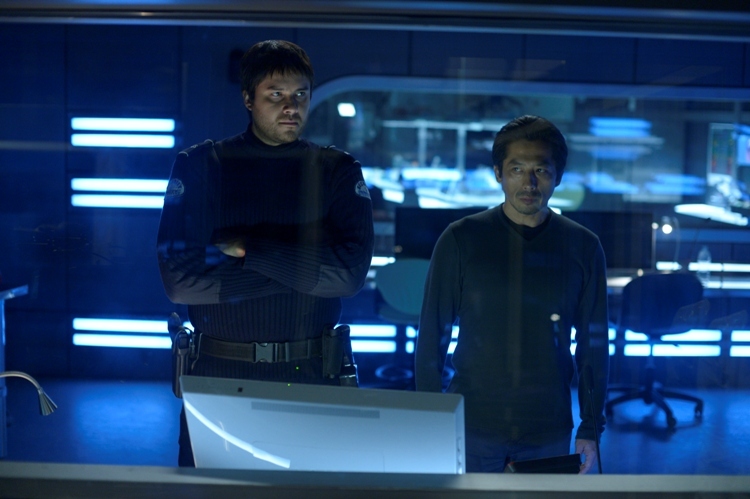 For people who haven�t yet seen it, what can you tell people about the show�s storyline: especially about your scientist character Dr. Hiroshi Hatake and how he relates as a pivotal figure to the plot and to the other characters on an urgent scientific expedition? 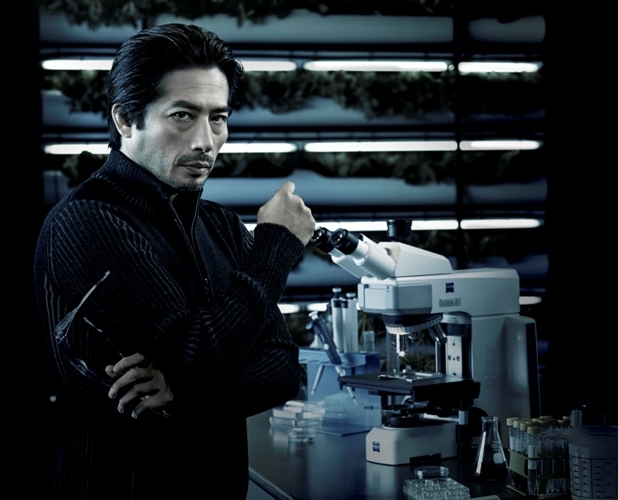 My role in Helix is Dr. Hiroshi Hatake. He is the director of research in the Arctic, at Arctic Biosystems. 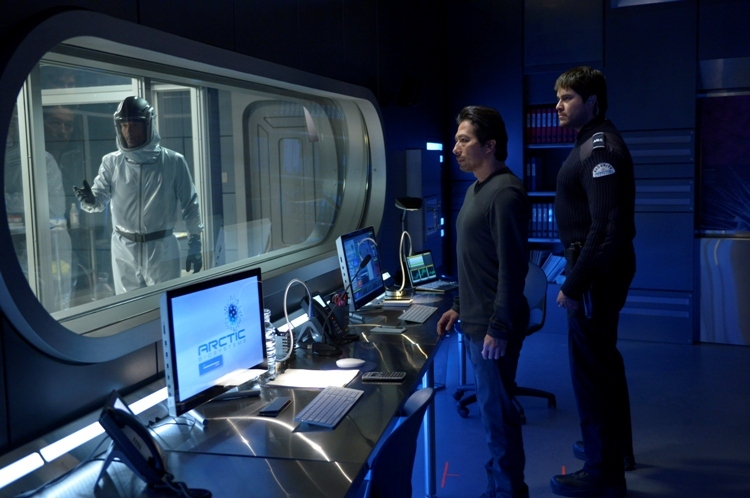 In the beginning of the story, CDC (The Center For Disease Control) members arrive to the Arctic base to investigate a possible disease outbreak. Dr. Hatake explains to them about the disease but he has a lot of secrets in his past. He is a mysterious man and has his own mission. It will be clear how he's involved with the disease and what kind of relationship he has between the other members little by little. Helix is executive produced by Ronald D. Moore, known for his esteemed work as a screenwriter and producer on Battlestar Galactica, Star Trek: The Next Generation and Star Trek: Deep Space Nine. How did you become involved with Helix? What�s it like working with Ronald and also Helix creator Cameron Porsandeh? I am so excited to work with Ronald and had a wonderful time during shooting. I received the script and the offer letter at the same time. I really enjoy the story and my role. Cameron told me that he created the character of Dr. Hatake for me. It's a very happy thing as an actor, but also, it's a lot of pressure for me, too. How did you prepare for and immerse yourself in your character? I followed my first impression for my character and I just reacted to the other actors on set. They helped me a lot and I enjoyed the collaboration with the great directors. You�ve done science fiction genre roles before, most notably as Captain Kaneda in the 2007 film Sunshine. But Helix is also a suspense thriller with a mystery to be solved as well. Are you a fan of those genres and how exciting is it for you to be playing Dr. Hatake? I am a big fan of Alien and many other science fiction movies. I was so happy to be a part of the cast of Sunshine. I learned a lot from the director, Danny Boyle. I really enjoy playing Dr. Hatake because he is deeply involved in the story, but with a mystery�. From the first fifteen minutes you feel Dr. Hatake is an ambiguous character with complex motives. Is he a hero? Is he a villain? Is he part of a conspiracy? Without giving too much away, what can you reveal about his hidden motives and agendas? Dr. Hatake has a huge dream as a scientist. He has devoted all of his life towards discovery. But sacrifice is always necessary for the development of science. So, he must be a villain for somebody, but also he could be a hero if he can get something! Part of a conspiracy? Maybe... As a victim?... Let's see! The project I�m most excited about of yours is the science fiction, fantasy drama Extant, your new summer 2014 TV series on CBS. You co-star alongside Halle Berry! The show is produced by Steven Spielberg for Amblin Television and is directed by Alan Coulter. How did you come to the attention of Steven Spielberg and how did he cast you in the series? I met Steven a few times before (Author�s note: Including during the making of The Last Samurai per Hiro�s management), but this is my first time working in one of his projects. I got the offer with a letter from the writer Mickey Fisher, and also the producer, in which they explained the story and my character. I am so interested in my role and so excited to work with them. 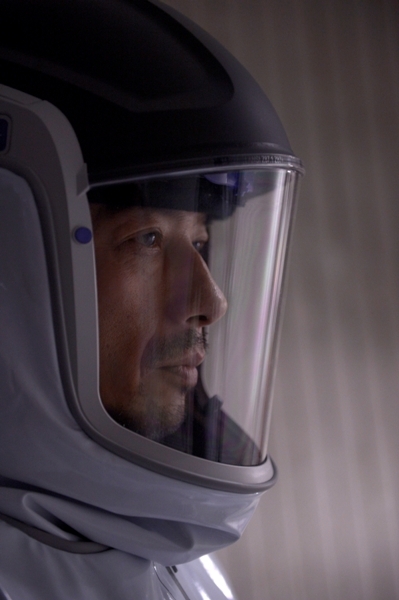 What can you tell people about the show�s storyline and your character Kinji Matsumo, in Extant? Kinji Matsumo is a wealthy technological genius who privatized the world's space programs into a single entity. One of my astronauts, who Halle Berry portrays, returns home after a year-long mission and tries to reconnect with her family. What was your first meeting like with Halle and what is your experience working with her and Steven? Well we have not started working yet. I have yet to meet her. You also star in the new film The Railway Man. You portray the real life, multi-dimensional character in the film, Japanese Military Officer Takashi Nagase. He�s a person who committed unspeakable atrocities against his fellow man, overseeing the imprisonment and tortures of British soldier Eric Lomax and the other POW�s. Yet after the war ended, later on in his life, Takashi was also a person who gave his life to atoning for his actions through incredible acts of compassion, charity work, and a complete evolution of the heart, later becoming a Buddhist Priest. What were the challenges for you, to create and find your emotional center for this deeply contrasting role � a person who was capable of such striking dualities as a human being? I was shocked when I read the script because I didn't know about this story. I read the novels written by both Mr. Lomax and Mr. Nagase. They told the same thing: about what happened in the past and how they could have a reconciliation. How they became friends in the end. When I got the offer I thought; as a Japanese born actor I have to do this role, even if it's a difficult and a risky character. On a lighter note, you also are voicing Sumo Villain in the upcoming 2015 animated feature film and Despicable Me spinoff, Minions! How did that voice acting role come about for you and how do you get into your character for that? What can you tell people about your character Sumo Villain and his plotting against the Minions? I don't know how this voice acting role came to me, especially in English. It was a good surprise though and an honor for me to get an offer to work on this kind of big successful series. I had so much fun when I first saw the image of the character. It was completely different from any other role I've done before. He is a sumo wrestler and looks funny but called �Villain�, means ....villain maybe? After doing projects that often are filled with such dark and gritty subject matter, is this a nice way for you to have fun, relax, and recharge your creative and artistic energies? I had so much fun playing my character for Minions, because it was my first experience to be a voice actor in an American animation feature film. Yes, I had a blast!! I just saw 47 Ronin and you are just phenomenal as real life Samurai hero, Oishi Yoshio. The 47 Ronin are part of Japan�s most venerable history and folklore. What were your emotions portraying a legendary hero so important to your nation�s history? At first I felt a lot of pressure to do that role, because I had watched a lot of my favorite actors play great Oishis before in movies and TV. But Oishi's character in this fantasy movie was very different from the original story of the 47 Ronin. I could create my own Oishi. I really enjoyed that freedom without the pressure of the traditional version of Oishi. Oishi, for me, was a chance for you to expand on a similar role, that of Ujio in 2003�s The Last Samurai alongside Tom Cruise. Ujio is a great warrior and an important mentor who teaches Nathan how to sword fight and stick fight. In 47 Ronin as Oishi, you are the star and you get to showcase your valor, bravery, and honor as a formidable warrior and great hero. What are your perspectives on the two characters, Ujio and Oishi? Ujio and Oishi were totally different characters for me, but both of them had the same Samurai spirit, I believe. They fought for loyalty, justice, and honor. Therefore, I wanted to put the Japanese spirit into both roles, even in the different story telling ways. What was the training like for your sword fights and stick fights for both 47 Ronin and The Last Samurai? Did you do your own stunts? I started to learn sword fighting when I was a child actor and I just continued learning until now. I'm trying to create an original fighting style for each character, including the choreography. I've done all the fighting scenes myself for both films. What about your stunts for your other films, be they science fiction or action. Do you do any stunts for them as well? I have always done the stunts myself for each role, if the director requests me. When I was a child actor, I was influenced by a lot of leading actors who performed their own stunts in the movies. I thought that's the greatest service to the audience, so I decided I should be able to perform any task required to make the characters more believable. Then I started training from the age of thirteen for all skills that could be required in the future. You also starred in the original Japanese versions of The Ring, 1998�s Ringu and its sequel, 1999�s Ringu 2 as Ryuji Takayama, the heroic man trying to save his family from an evil spirit�s deadly cursed videotape. What was your creative experience working on this gothic and very terrifying horror story as well as portraying a man trying to save his wife and child from an evil ghost? It was a great experience for me because Ringu was my first horror movie. I had to use my imagination to create the scary scenes because I couldn't see the ghost on set. Do you enjoy scary movies and what are some of your favorite horror films? I enjoyed The Exorcist and Carrie when I was a boy. Why do you think that Ringu captured the imagination and popular culture of so many people here in the USA, as well as influencing how American filmmakers make horror cinema? Japanese traditional horror is very dark and slimy... very creepy. I think those visions and the idea of the Ringu story were fresh for the audience in the US. The director, Hideo Nakata, was good at creating those visions in the film. My favorite film of yours is 2002�s sublime Tasogare Seibei, (The Twilight Samurai). You are absolutely superb in this emotionally meaningful, tender, and moving film. It�s a wonderful, beautifully drawn, and emotionally rich and often complex character study. Although Seibei Iguchihe is a Samurai, he finds his great and true happiness just staying at home and being a family man, loving and taking care of his two daughters and elderly mother. It really is a once in a lifetime role and for many it is your signature role that showcases your emotional depth and range as an actor. How did that film come about for you? How did you prepare for and immerse yourself in a role of such deep and beautiful emotional nuances and complexity? I received the script while I was staying in London. I thought this is the script that I've been waiting for, for a long time. I immediately called my manager and said that I should do this! It was so smooth to get into the movie's world and into my character. I loved this film because it was such a unique Samurai movie. My character Seibei is a good fighter in school, but he never drew his sword in real life. He is always fighting against poverty, which he and his family face, but he loves spending time with his daughters and wants to become a farmer. Unfortunately, he had to fight against another Samurai due to his master's order. Each fighting scene has a reason and meaning. It was the best balance between drama and action. Director Yoji Yamada tried to create an authentic atmosphere in the film so I could feel like I was living during that period as Seibei. How did the international success of The Twilight Samurai affect your career? Was that when Hollywood and America first recognized and took notice of your talents? Yes, I think so. Thank God for this film! You�ve shined in some independent and art house films, including 2005�s The White Countess opposite Ralph Fiennes and 2009�s The City Of Your Final Destination starring with Anthony Hopkins, both for Director James Ivory. You starred in last year�s The Wolverine opposite Hugh Jackman and directed by James Mangold. In 2007 you starred with Chris Evans in Director Danny Boyle�s Sunshine, and you starred with Chris Tucker and Jackie Chan in Director Brett Ratner�s Rush Hour 3. How did these creative experiences and working with these esteemed directors and actors shape and evolve you as an actor? Every experience has trained me and inspired me so much. I'm so lucky and happy to have had the opportunity to work with them in my life. It's a wonderful thing not only as an actor but also as a human being. Working with great people keeps me fresh and teaches me that I am forever, a student. You�re also a gifted singer, musician and composer. You appeared in the Japanese stage productions of the musicals Little Shop Of Horrors and Big River. You also composed the film score for 1990�s Rimeinzu: Utsukushiki Yusha-tachi (Yellow Fangs), which you also starred in for Director Sonny Chiba. What first inspired you to become a songwriter, a singer, and a musician? How did you become involved with the film in composing the score? I started singing on stage when I was twenty years old and wrote some songs myself, and I directed my concerts too. That's why they requested me to be the director of music for this movie. What artistic challenges does film scoring pose to you? Not just writing music, but also adapting it for film via timed cues, edits, rough cuts, accents, spotting, synching, etc.? My favorite director, Kinji Fukasaku, was a supervisor for that film. He gave me a lot of advice during the post production. It was a great experience to learn how to make a movie. What first inspired you to want to become an actor? I was scouted by a child actor�s school when I was four years old. I was on a film set before I watched any movie for the first time in a theater. That movie, which I did when I was five, was actually the first movie I ever saw, and it was in the screening room of the film studio. Do you remember your first audition and acting role? My first audition was when I was five years old, for the role of a Yakuza's son. Director Akira Kurosawa and actor Toshiro Mifune are perhaps the most iconic influences in Japan�s cinema, as well as influencing American and international filmmakers around the globe. How much of an influence is their work on you as an actor and to your craft? I'm a big fan of their films and I�m inspired by their internationally acclaimed work in film. In 2002 you were bestowed with an honorary MBE (Member Of The British Empire) by Queen Elizabeth II for starring in The Royal Shakespeare Company production of King Lear in 1999 and 2000. How artistically fulfilling was that experience for you? What were the challenges for you in tackling and inhabiting one of Shakespeare�s most iconic characters and plays? King Lear was one of the biggest challenges in my life, because it was my first time acting in English in front of a live audience. I think that experience changed my life and it made me decide to continue choosing international projects. How did you become involved with The Royal Shakespeare Company? When I played Hamlet in London (in 1998), it was with a Japanese company. The Royal Shakespeare Company was looking for an Asian actor at that time. Nigel Hawthorne, who played King Lear, and the producer for King Lear, Thelma Holt, visited my dressing room after the show. Then they asked me "Do you fancy playing The Fool in King Lear with us?" I said "Excuse me, in English you mean?!" Would you like to do more theater, perhaps perform some modern playwrights� works both here in the USA on Broadway and also in London? Yes, I'd love to, if I have the chance. What are some of your fondest memories as an actor, regarding the directors, actors, and your many wonderful projects on stage, screen, and TV that you have experienced in your stellar career? When I was in The Royal Shakespeare Company, we spent seven months together in London and Stratford-on-Avon. It was the best balance between an exciting stage career and a peaceful life for me. Also, when I shot James Ivory's The City Of Your Final Destination in Argentina, we stayed in the beautiful Estancia. We spent a great time together including Thanksgiving, Christmas and New Year�s Eve. It was like a dream for me. That kind of atmosphere helped me create a nice relationship between the cast and the crew. I have a lot of unforgettable memories for each project and they are my precious treasures. What actors and directors are on your dream list and would you most like to work with to evolve and stretch as an artist in your craft? All of the great actors and directors I have worked with I want to work with again. I have a lot of favorite people who I want to work with, but I'd especially love to work with Steven Spielberg with him directing in the future. 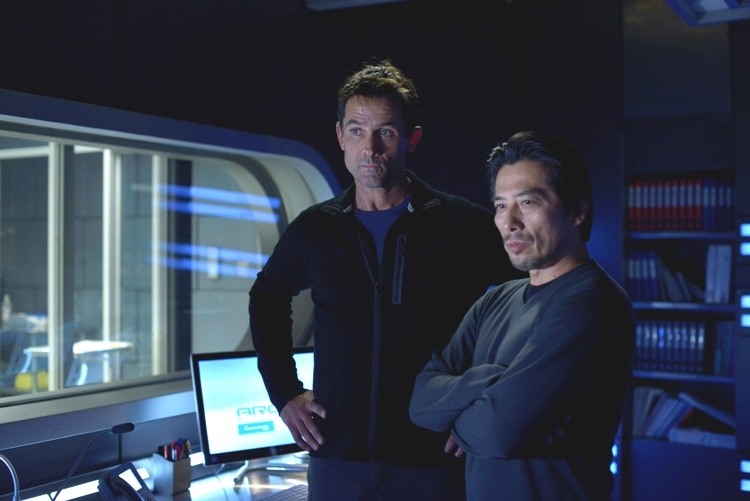 CLICK HERE TO SEE WHAT CO-STARS BILLY CAMPBELL AND JORDAN HAYES HAD TO SAY ABOUT HELIX! #1 � 2013 Justin Stephens. Courtesy of NBC. All rights reserved. #2 � 2013 Philippe Bosse. Courtesy of NBC. All rights reserved. #3 � 2013 Justin Stephens. Courtesy of NBC. All rights reserved. #4 � 2013 Justin Stephens. Courtesy of NBC. All rights reserved. #5 � 2013 Philippe Bosse. Courtesy of NBC. All rights reserved. #6 � 2013 Philippe Bosse. Courtesy of NBC. All rights reserved. #7 � 2013 Philippe Bosse. Courtesy of NBC. All rights reserved. #8 � 2013 Philippe Bosse. Courtesy of NBC. All rights reserved.